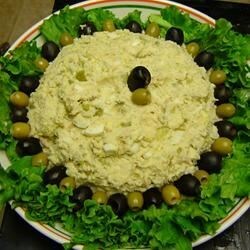 "This is a Russian salad that is eaten in many Mediterranean countries as well. There are many variations of the name, but the recipe originated in Russia. Serve cold, with warm flatbread or pita bread "
Place potatoes into a large pot and cover with salted water. Bring to a boil, then reduce heat to medium-low, cover, and simmer until tender enough to pierce with a fork, about 30 minutes. Drain and allow cool, then peel and dice. Place the diced potatoes into a large mixing bowl and refrigerate until cold. Once cold, fold in the mayonnaise, celery, eggs, chicken, mustard, olives, salt, and pickles. Refrigerate 2 hours before serving. they forgot a can of sweet peas! i've never heard of olives going into olivieh! that isnt russian!! Every Russian family makes Olivyeh a little different, but this is definitely not it! I have made this recipe many times. Everyone loves it! I don't measure my mayo and use a soy free brand.